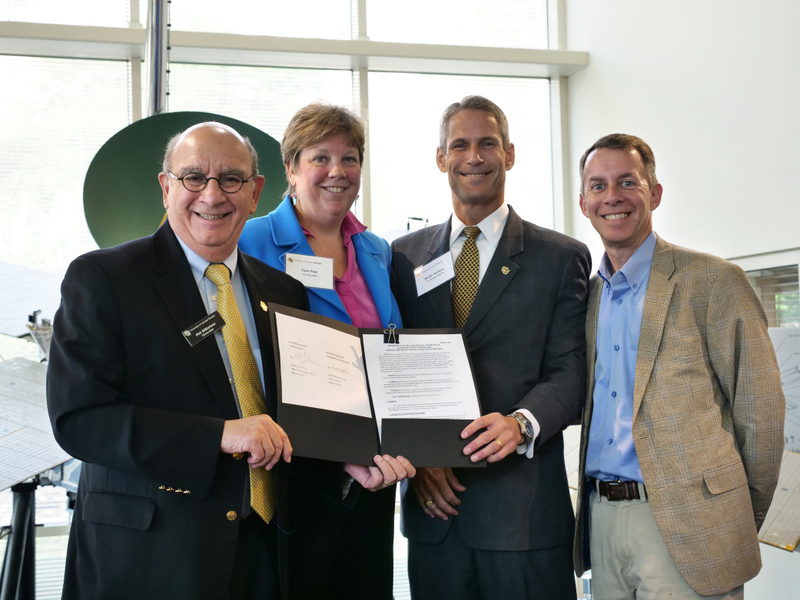 August 29, 2017 – Building on a $3 million partnership announced in 2016 to establish new academic programs focused on radio frequency (RF) systems, Lockheed Martin and CU Boulder today announced a follow-on Master Research Agreement (MRA), signed during a morning ceremony on the CU Boulder campus. The agreement provides a framework for all future research projects and was signed today by Lockheed Martin CTO Keoki Jackson and CU Boulder Chancellor Philip DiStefano. The agreement structures future research and academic programs aimed at creating the technologies, industries and workforce of tomorrow while growing the research synergies between the two entities today. Improving spacecraft, aircraft and ship power systems – Developing new techniques to improve broadband, linear radio frequency (RF) power amplifier efficiency for power constrained systems for space, airborne and shipborne applications. Increasing mission capability – Efficiently converting infrared (IR) radiation to DC power to recharge unmanned aerial vehicle batteries remotely. Increasing capability of satellites while reducing weight – Advancing technology related to Simultaneous Transmit And Receive Systems (STARS) to reduce the number of antennas on a communications satellite or to double their signal throughput. Improving power management for commercial and national security applications – Developing novel architectures and control techniques to substantially cut the losses and reduce the size of power management in RF, digital and analog electronic systems for satellites, missiles, and other commercial and defense applications. Kathryn Tobey, vice president and general manager of Special Programs at Lockheed Martin Space Systems, said the CU Boulder community is an integral part of Lockheed Martin’s local effort to collaborate with academia on the work Lockheed Martin is doing in Colorado. “It is rewarding to see students visiting Lockheed Martin’s RF Payload Center of Excellence to collaborate, and we are proud to connect CU Boulder’s highly-skilled talent with exciting research opportunities,” Tobey said. Lockheed Martin’s support extends also to promoting faculty in the form of a Lockheed Martin Corporation Endowed Chair of Radio Frequency Engineering and a Lockheed Martin Junior Faculty Fellowship in the College of Engineering and Applied Science. The first recipients of these prestigious positions are Professors Zoya Popovic and Taylor Barton in the Department of Electrical, Computer and Energy Engineering. Popovic is a Distinguished Professor, and her teaching and research has been focused on radio-frequency engineering for the past 27 years since she joined CU Boulder. Barton will be the inaugural recipient of the endowment associated with the Faculty Fellowship for an outstanding junior faculty member whose research is focused on radio frequency engineering. CU Boulder strongly supports Master Research Agreements that further solidify and expand long-standing relationships between CU Boulder and industry partners in a variety of research pursuits, resulting in increased efficiency in proposal response, project award and post award administration for departments and institutes.